Knives like the Benchmade 484 Nakamura are rare. 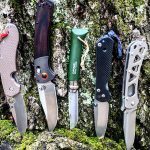 A lot of knife companies are focusing on the form of their blade as well as the function—but there aren’t a lot of knives that have the small details that the 484 has, which makes this knife both an everyday-carry knife and one you can wear with a nice suit. The Benchmade 484 is almost as fun to look at as it is to use. By selecting M390 steel and contoured G10 handles, Benchmade has created a functional piece of art with the 484. G-10 is a fiberglass-based laminate that has solidified itself as the common mainstay for handle material today’s knives. It’s durable and allows for a good grip, even in the sloppiest conditions. When you pair it with a super steel like M390, and build it all off of a thick stainless steel frame; you’re working with fried gold. Contoured handles that force your fingers into predetermined grooves are always a gamble. On smaller knives like this 484, I found the handle grooves to be spot on but in a bigger hand, they can make the grip seem unfamiliar and uncomfortable. Beyond that, this knife performs like a Jedi Lightsaber as the shape of the blade and the M390 steel allow it to pierce, slice, and chop with ease. If you see a knife with M390 or Elmax steel, it will take more out of your wallet but pay you back ten-fold in function. You might as well retire your sharpening stone and honing oil, because you won’t need it for years to come. After slicing up the shipping boxes the 484 came in, I was still able to easily slice through paper—and more cardboard—like a razor. Additionally, with a little bit of pressure on the spine, I could push the blade right through 3mm and 5mm cordage. It’s almost silly sharp. I might as well put in 10 for a durability score on all of the Benchmade knives that come through the office. I still test them like I do any other knife, but I know that they are built to last and will stand the test of time. Because of its composition and popularity, M390 Super Steel will drive up the price of anything it’s attached to. But, believe me, it’s worth it. This steel—featuring high levels of chromium and vanadium—is extremely corrosion resistant, and too stubborn to get dull. However, in today’s market, the average consumer may be hard-pressed to pay more than $150 for a standard pocketknife.